This water pitcher was made before Laughlin became Homer Laughlin. 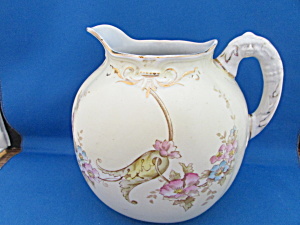 Pitcher has the "Eagle/Lion" markings with "Laughlin" on the bottom. It is in excellent condition, no chips or cracks. Pitcher is 6 3/4" tall and 6 1/2" in diameter. The width with the handle is 7".